Dr. Padma Subbaramu is a UK trained Pediatrician & Neonatologist with a special interest in Neurodevelopmental Pediatrics. Dr. Subbaramu earned her medical degree from Gandhi Medical College, Bhopal in India in 1992 and was awarded the MRCPCH by the Royal College of Pediatrics and Child Health, London in 2001. She holds permanent registration with the General Medical Council (UK), the medical governing body in the UK and Karnataka Medical Council, India. 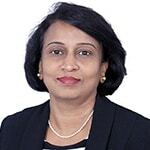 She has more than 20 years of diverse clinical experience in General Pediatrics & Neonatology as well as across the breadth of Pediatric subspecialties such as Pediatric Neurology, Pediatric Nephrology, Pediatric Cardiology & Cystic Fibrosis, and Pediatric Surgery, from internationally reputed hospitals in the United Kingdom and India. She also has to her credit, extensive clinical experience in Pediatric Hematology & Oncology at the acclaimed John Radcliffe Hospital in Oxford, UK and Kidwai Memorial Institute of Oncology in Bangalore, as well as in Clinical Cancer Genetics at Manchester, UK. Her area of special interest and expertise however, is centered around child development and its disorders, which includes developmental assessments and multi-disciplinary management of children with disability & special needs as well as assessment, diagnosis and multi-disciplinary management of children with Autism spectrum disorder, ADHD, PDA, Sensory Processing Disorder, Auditory Processing Disorder, learning difficulties/disabilities, Dyspraxia, Cerebral Palsy and developmental delays. Dr. Subbaramu is passionate about her work with children and considers herself an ‘advocate’ of children. She is known for her outstanding communication skills, and one of her greatest strengths as a Pediatrician is her ability to connect with children (and parents) and put them at ease instantly. She is meticulous and methodical in her approach and believes that parent education is the key to raising healthy, happy children. She is a professional who values ethics, practices evidence-based medicine and follows international and national protocols in patient management.